In the middle of an exciting action game, a dialog that will off er easy accessibility options pops up. But you absolutely do not want this. The Filter Keys dialog in Windows pops up if you keep the right [Shift] key pressed for at least eight seconds. When playing games, this can happen by mistake. You can deactivate the key combination somewhat hidden in the configuration of the accessibility settings, and thus suppress the dialog. In Vista and Windows 7, click ‘Ease of Access’, then on ‘Ease of Access Center’ in the Control Panel. There, follow the link ‘Make the keyboard easier to use’. 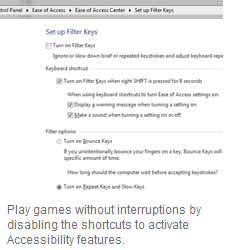 Using the ‘Activate Filter Keys’ option, you can activate and deactivate the function. To deactivate the disturbing key combination, follow the link ‘Keyboard shortcut’. In the ‘Key combination’ field, deactivate the option ‘Activate Filter Keys if [SHIFT] is kept pressed for 8 seconds’. Confirm the change at the end of the dialog with a click on ‘OK’ to return to the previous dialog. You can now close the window. In Windows XP, double click the ‘Input devices’ icon in the Control Panel and switch to the ‘Keyboard’ tab. In the next dialog, deactivate the ‘Activate keyboard shortcuts’ option. You will have to make other settings. Confirm the change with ‘Accept’ and ‘OK’.